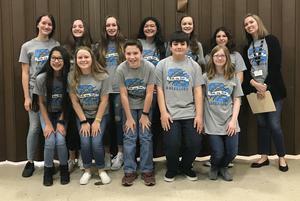 Congratulations to all the Middle School Battle of the Books teams! Oak Grove Middle School is DCS Battle of the Books Champion! OGMS will compete in the regional competition! Ledford MS took 2nd place and North Davidson MS was awarded 3rd place. Read more and see photo gallery by clicking on the above headline. Congratulations to all the Middle School Battle of the Books teams! Oak Grove Middle School is Davidson County Schools' Battle of the Books Champion! OGMS will now represent DCS in the regional competition! The teams read a total of 27 books to prepare for the competition.